The main Tracktion screen is split into two basic areas. The top section contains the music tracks (audio and MIDI) including the inputs to the left and the filters to the right. 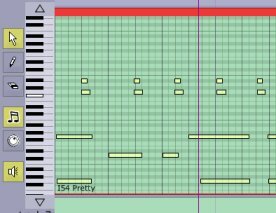 The bottom section is context-sensitive: whenever anything in the top section is selected whether it is an input, a complete track, a clip on a track, a MIDI note or a filter, then the bottom part displays whatever is relevant to that selection. This simple idea is the basis behind Tracktion's elegant interface and does away with the clutter of pop-up windows that have a tendency to invade the screen on other systems. In fact, about the only pop-up you will ever see, apart from the occasional dialog box, is when you select a VST/VSTi plug-in. The image on the right shows the main screen with several tracks containing both audio (wave files) and MIDI. 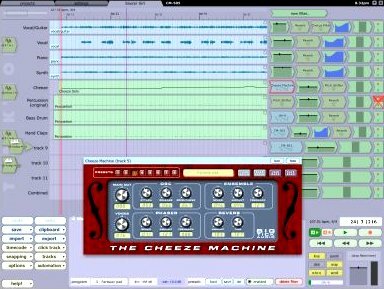 The pop-up is the Cheeze Machine VSTi. The middle track area can be quickly zoomed in or out just by grabbing and dragging with the mouse, while dragging the time bar at the top scolls it horizontally. Setting up the input source for a track is simplicity itself. To the left of the tracks are icons for each available input on your sound card (some sound cards may just have two analogue inputs, others will have more). Tracktion can treat audio input pairs as either normal stereo or as separate individual inputs in which case there will be two separate icons for that input pair. To connect an input device to a track you just pick up the relevant icon and drag it right towards the track that you want to use it to record upon. When it gets close then it 'grows' an arrow which attaches it to that track. To remove the connection, just drag it to the left until the connecting arrow disappears. In the picture to the left one of the Audigy MIDI inputs has been connected to track 9 while another MIDI and analogue input remain unconnected. 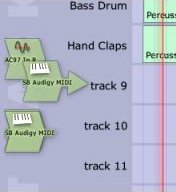 Double clicking on a MIDI track will expand the track to show the MIDI editor where you can tweak individual notes, copy or add notes - generally, all the things you can do with pretty much any other sequencer. Double clicking an audio clip will play it. Clicking on a track name (which start off being named track 1, track 2 etc.) enables its output destination to be selected which can be any of the audio or MIDI outputs as well as other tracks. This latter option means that several tracks can be made to pass through one set of filters before they are output. Other full track options include: an undo-able freeze option - ideal if you want to free up CPU usage while working on other tracks; manual fine control over when a track plays its contents back (in relation to other tracks); and the ability to directly render a track down to a single file.